Very fast shipping and when I took them out of the box, they are not disappointing in the quality or the colors. The colors are just as stated in the picture and in the description of the bedding set. This is a purchase I am very excited about. Makes my master bedroom very pretty. Update your bedroom decor with this 'Mavia' six-piece comforter set. 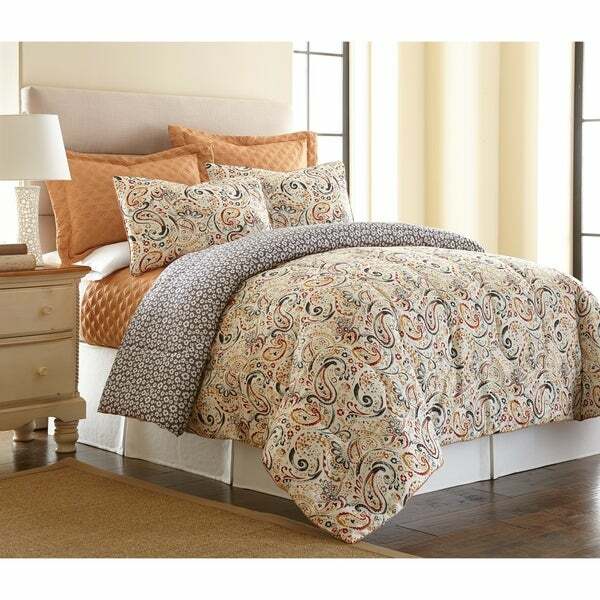 Featuring a reversible comforter, coverlet, shams and pillows, this set is machine washable and easy to care for. The fun geometric design adds interest to any master or guest bathroom, with colors that blend nicely with both traditional and modern surroundings. Our luxuriously silky brushed microfiber material is constructed using techniques that include better stitching, stronger weaving, and softer materials; Ensuring a durable and soft touch. Fashion meets luxury with this set and is the perfect solution to your decorative and comfort needs. Care Instruction: Machine washable and dryer safe. Recommended - Machine wash gentle cycle with cold water. Sun dry or low tumble dry. Perfect comforter set..bought for my grown daughter. Excellent quality. Fabric is smooth to the touch, warm but not too heavy. Great selection of patterns. More vibrant than picture. Also came with a really good gold colored quilt. Got the king size for her extra high bed. The comforter hangs 3/4 down the sides of the bed. So no need for bed skirt. I would imagine that the queen size would be ample for a regular queen bed. Excellent buy. She loves it! I had to submit a bad rating for another item, but not for this fantastic comforter set. I just love the bright colors, the shams that match the coverlet and the really pretty reversible comforter and the other shams. I've had so many compliments on the whole set. I highly recommend the set! What is even better, it is so affordable! Thanks, Overstock, for making my bedroom so cheerful! The Amrapur Overseas Mavia Reversible 6-piece Comforter Set with Bonus Coverlet Set (King) was purchased for a guest room in my very old New England home. The color and pattern are vibrant and beautiful. The pattern is pretty and contemporary without being too trendy. The fabric is of good quality. I am very pleased that I made this purchase. The set really perks up the room. The items were shipped quickly and well packed (and free.) Happy Overstock customer! I ordered this comforter set to give a new look to our queen-size bed. What great pricing for this fresh looking set. The fact that it includes a coordinating coverlet, reversible comforter and matching and coordinating shams was perfect! The comforter is lightweight but, wow, is it toasty! So glad I bought! I am definitely recommending this bed set. The colors are true and vibrant, the cotton is soft and washes very well. Being completely reversible, this set is brilliant value. The comforter is summer weight, very light and airy. The quilt is very versatile, I was not expecting it to be full size. Pillow covers and shams finish off the bed set beautifully. (This set is so easy to wash and dry too). Buy with confidence. Love my new comforter. This is a great set. You get a comforter, a coverlet, and 4 shams. You can’t get much better than that plus the sale price. Under $ for this and beautiful drapes. Nice light weight comforter. Oh, and it’s reversible along with 1 pair of shams. I absolutely love this. The material is very soft and the colours are very true from the picture provided. I ordered a king size for my queen size bed (because I like the extra draping). The fit was PERFECT!! If I could complain about anything it would be the rust coloured shams having the flange around the edges, which I knew they were there in advance, so it's not much to complain about. It would have been a cleaner look if they weren't there or were a little more stiff....but it doesn't matter because this set is absolutely gorgeous!!!!!! I have looked for a bedspread that is gray and accented with a complimenting color. The salmon color is subtle, but the bedspread colors are a bit brighter. Overall, quite pleased! looks much nicer that it's price, great for not showing dog hair!! This is a beautiful set for a guest room. I specifically wanted bedding in the orange...spice area. The coloring in this bedding is definitely mustard yellow. Lovely. I love the colors. The comforter is so soft. It’s not to hot. The whole set looks so nice on my dark stained poster bed. We have been very happy. This was a great deal. It's quite a nice set especially for the value. It's perfect for my guest room. Soft and well-made. Love the color combination. Nicer than the pics. My all-time favorite bedding.....chic, mixable, light as a cloud. Really makes the room! Like this set so much it is my second. Purchasing a new house and when looking for a new comforter set for the home found nothing that I like more than this one. So I simply re-ordered the same set. Would truly recommend this set to anyone looking for a quality set. I have been very happy with this set. It matched the golden oak furniture and gray walls, bringing together the colors nicely. It is warm, but lightweight. It was very well worth fading. I loved this comforter, it looks great in my son' bedroom.It's a good quality product. I am saving this one for the fall because the colors represent fall. My mom wants one so I may order another one soon. Beautiful colors and good quality! "Does this have a silky, slick or slippery feel or more of a soft cottony feel? I prefer the soft cottony feel. Thanks"
The comforter has a soft cottony feel, it's very comfortable and pretty. It has a soft and smooth texture. The feel is what I like best. I think I will sleep on top of the comforter. My 7 y/o grandson said he would not get off the bed it felt so good. "Are the swirls black or navy and is there any gray? Is it gold or orange?" The swirls are a dark Navy. Yes there are swirls of Gray in there as well. The color is between an orange and gold. Closer to like a mustard. It is very pretty. Hope that helps. "Is the red tone a bricky red or is it orange? Other questions indicate it has gold tones also "
Hello , the solid Quilt has an orange tone. 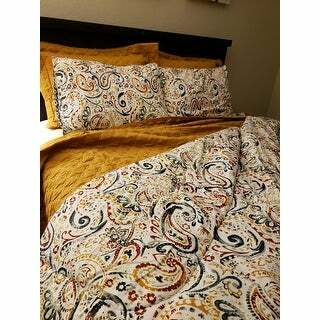 The printed Comforter does have bricky red , orange and gold on the print itself. Have a great day! "Is the coverlet the gray small flower piece as featured?" Hello Alice, the coverlet is more of a warmer burnt golden color.Please feel free to contact us again with any further questions. Thank you for shopping with us! "is the color of the shams and coverlet gold? It's looks gold on my screen but I'm not sure." 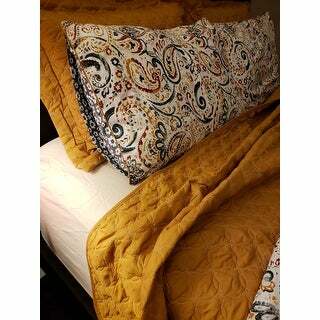 Hello fiorio1, the coverlet and shams are more of a warmer burnt golden color. We try to represent the colors of our products accurately. Unfortunately, due to the difference in monitor colors we cannot guarantee that the color will match exactly what you see on your screen. Thank you for shopping with us. "Is this item in stock?" Hello happyhummer, yes, this item is currently in stock. Thank you for shopping with us! "What are the colors in this comforter set?" Hello jenn, unfortunately this item is out of stock. We currently do not have inventory to check, and cannot guarantee the item will be restocked. Thank you for shopping with us.